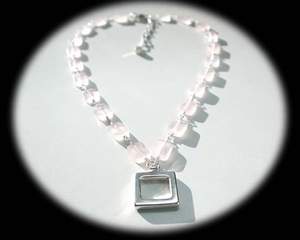 JKAT"s solid sterling silver simple square pendant with sterling wire work and smooth rectangular cuts of pink quartz is fresh, modern and a strong choice. Adjustable from 16" to 19". home | shipping | store policies | email | site map | view cartCopyright © 2011 JKAT Jewelry. All rights reserved.